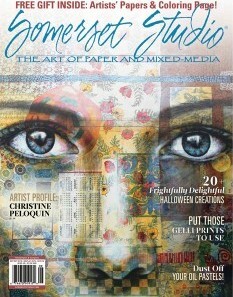 It's StencilGirls Blog Hop Time & A GIVEAWAY! 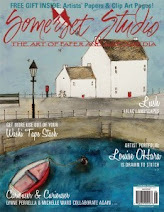 Well it's time for another Blog Hop on the StencilGirls Talk Blog!!! AND we have a GIVEAWAY!!! All comments on the hop are eligible for the giveaway. The more blogs you comment on, the more chances you have to win. Giveaway will close on Sunday, May 4th at 11:59PM Central Time. PRIZE: 2 lucky winners, each will get a set of Seth Apter's new releases. This time I used the stencil Inside Out. I love working with paints and inks on the stencils so that's what we did here. Father's Day is around the corner, and this would be fun gift to give to Dad. This is a Masonite Male Bust XL cut-out from Retro Cafe Art Gallery that comes with 4 pieces. It also has a heart and a crown. First I base coated both pieces with Stone Fresco Paint. Then I added several greens to the back with foam squares. 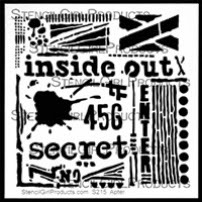 I used Eggplant paint to add the "456" and "secret" sections of the stencil. Dark Blue Tombow and White Sharpie pen marks are next. The "Enter" part on the right is stenciled with Black Archival Ink. I filled in 3 spots with a small stamp and Sepia Archival Ink, then stamped "man" on the head with Jet Black Ink. I liked this side the best, so it's the front to me. Again using the stencil, only with a Snow Cap White paint dabber, I added the areas as shown. Then to highlight them, I outlined them in dark blue pen. The same stamps were used on this side. Here's a detailed closeup of the stand. The base is painted with 3 Fresco Paints and stenciled using Jet Black Archival Ink. The White Sharpie Pen makes the colors pop. I painted the Crown and the Medium Gear Wheels with Tarnished Brass Distress Paint and stamped an image on the Crown from Lynne Perrella's LPC028 collection. This set also has the other small stamp I used. Then I drilled a hole in the base and added a length of chain with 2 die cut Mini Clock Keys of black chipboard glued together for the pull. Glue on your wheels and you're good to go! And they really turn! That's it for me. 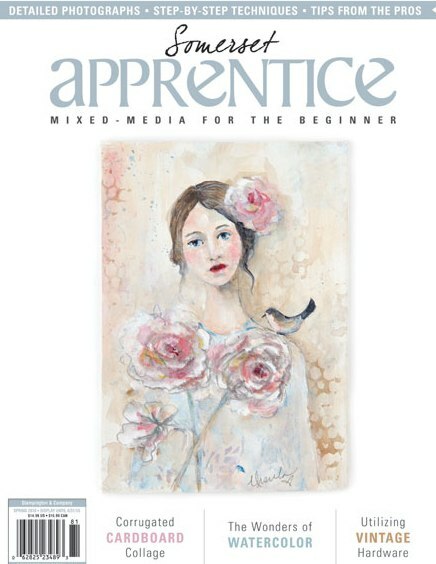 Check out the other fantastic Artists on the Hop, and don't forget to leave a comment to win a chance for a StencilGirl Prize!!! The colors are so rich and deep that they need little to make them shine. I only used a bit of Tea Dye Distress Ink in places to make them a tad richer. This is a long one, so, get a cuppa and get comfortable. I'll lead you through it. The base is one of my favorite pieces from Retro Cafe Art Gallery. It's the Large Tower Shrine Kit (9 1/4 inches) and it couldn't have worked any better with these papers. It was like they were designed to go together!!! This shows 4 pieces of paper cut and layered as a rectangle that will be glued to the Masonite shown here. Perfect size! The 8x8 paper pad comes with 3 sheets of each paper, so I was able to cut 2 exact same pieces for the inside of the roof. Use an exacto knife to cut out the slot needed as shown here. My favorite color combo ....red, black, ivory, and brown. I cut apart the strips of back letters and numbers to make a frame for the Typography sign. Four of the side sections are just cut and glued to the inner sides. The 2 larger ones are each 2 layers of papers cut to fit the middle of the side pieces. The Middle section is covered with a gorgeous sheet of Celebrate. Then layers of cutouts are added. I lay out my pieces before gluing it all together. NOTE: the side sections are upside down in this picture....would not have fit together well if glued as shown!!! Here I've glued papers on and set it up to see exactly where to put the next layer of pictures. Mark with a pencil where your shelves will be before gluing the next layer on. The sides have 4 different paper layers ending with the Numbers in the center top. The entire back section will be covered with paper. I trimmed off a strip of edging and glued it to the right side of this portion. More cut outs are glued on to add balance. I painted some wooden legs with 2 bright shades of blue Fresco Paint. The bottles sit nicely onf the back edge, and 3 Shabby Chic Ornate Metal Keyholes were also added. I used Glue-N-Seal Matte on the Corked Vials that added a frosted, vintage look. The roof is decorated with small Regal Stencil Border Strips from Retro Cafe Art and are painted with Fresco Paints in 2 different colors to make them look weathered. Use a punch to cut out the medallion for the roof. It comes as a straight cutout and I trimmed it to fit. Worked perfectly! This is probably my favorite section of the papers since it's so brilliant with color, and it says CREATIVE! I painted the Letterpress Blocks with several different shades of Fresco Paints and set them on the shelves. The phrases are some of my favorites, too. The back is as fun as the inside! As always, thanks to Graphic 45 for an outstanding collection of papers and to Kristin for her wonderful Coffee Break Designs at RCAG. Check out the links for products...you won't be sorry! And let me know what you think!!! 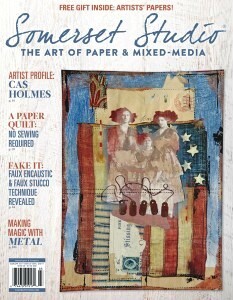 I've always loved this 8x8 Collage Paper Stash from Tim Holtz. It has some of my favorite designs that just don't need anything else but the papers themselves. So, I had 3 sizes of Artist Trading Blocks cut out of black mat board sitting on my work table....calling my name....and this is the result of just a couple of hours of play. You can fussy cut a few pictures and layer on numbers or more pictures. Each side is quick and easy to put together! Make sure you always check the direction of each side. It takes a bit of thinking as you see here, they don't all go the same way. The top and bottom squares have to be going in the right direction. I like to add Distress Inks to the papers to make them a bit more colorful, here Tea Dye, Fired Brick, Peeled Paint, and Old Paper do the trick. This is a detail shot of the smallest one...just a couple of Numbers cut out, inked and glued to another piece of the collage papers. The larger ones are from the original 12x12 sheet. I like the "glow" that the Tea Dye adds to the papers. It just kind of makes the colors richer. I loved how the little clocks fit perfectly onto the middle sized block. The Pilot and the Vintage Car photos are warmed up a bit with Old Paper and some Tea Dye. The tiny Bingo Numbers could represent dates on your collages. Inspiration Emporium. Just click on the links. Don't forget to use my code iecain81 and get 10% off your order!!! So get out your papers and glue stick and have some simple, easy, fun. They really are great to make and share! Sometimes it's hard to create a tag that's good for a man or a boy. I think this one is perfect for that guy that you want to wish a Happy Birthday to, or just send along a Wish for them in a life event. This starts with a smaller #5 Manila Tag and a swipe of White Gesso in the center. When it was dry I added Distress Inks. Then I dripped water onto the Inks and let it puddle before blotting it off. The next layer is stamps. Orange Blossom and Sepia Archival Inks are used with the Checkered Stamp from SCF07. The Black Embossing Paste and the Latticework Stencil are applied in 3 sections and left to dry. I LOVE LOVE LOVE the contrast! The Classic SCR02 stamp and Sepia Ink fill in background and the sentiment is stamped in Jet Black Archival ink. I painted White Gesso onto a scrap of Manila Cardstock and let it dry. Then I stamped the King Chess piece from SCR018 in Peacock Feathers Distress Ink and embossed with Super Fine Clear Embossing Powder. I added the same stamp over the top of the blue stamped image with black archival ink slightly to the right. Last I stamped the same stamp one more time to the right and down a bit with Sepia archival ink. Heat set each stamping, and cut out the image. It's added with black foam squares. The tag is layered onto black mat board and the Gold Mini Corners are pinched onto the two bottom corners. I used my jewelry pliers and they go on easily. The 2 Arrows are glued into place and the Gears and Mini Gears fit slightly under the Chess King. I could have added white pen marks around the edges, but I wanted to keep it clean and simple.....so I stopped. It was hard for me, but I stopped. You could also add more gears.....but I held back and stopped.....it was difficult...but I stopped! Check out the products below for links to Inspiration Emporium, use my code iecain81 for 10%off your order, and give it a go for your guy. I used 2 microslide pictures from a collage sheet. This one is on a one hole acrylic slide. with the word Song glued onto the collage sheet. I added the sheet with Wonder Tape to the acrylic slide. Then the piece has Gold UTEE added to the sides. The little birdcage charm has it's loop carefully cut off before gluing to the front. I used a blue Sharpie pen to add color to the little bird. Glue on 3 Flowers and 3 tiny Pearls with a strong glue to the front. This one is made using real microslide glass in a Memory Frame. I cut the bird at the bottom out of a collage sheet and glued on to lower corner. A few script stamps were stamped with Jet Black Archival Ink. Faith is a Word Cut Out. The little Moth was painted and stamped before being glued to the frame. I also edged it a bit with tarnished brass paint. I used Distress Ink to add color to the back of the collage sheet picture, and then stamped a Lynne Perrella stamp with archival ink. These little treasures can be worn as pendants or added to cards and Mixed Media projects. Send one to a friend and they'll love it!!! Wonder Tape, Mini Pearls, Blue Sharpie, Ribbon. Assorted Squares Love Mix DP95, 1x3 Memory Frame, Collage Words Newsprint Paper Cuts, Garden Insect Cut Outs, Jet Black Archival Ink. Memory Glass 1x3, Mini Pearls, Ribbon, Stamps, Acrylic Paints. 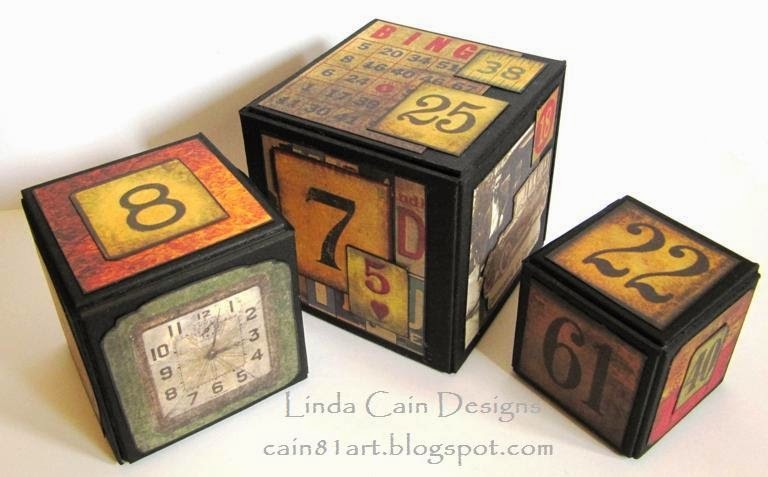 I really have fun with the Artist Trading Blocks using the 3D ScoreBoard XL Die. I can't wait for Spring...although it's "supposed" to be here already! So using the large 3 inch block die and some really bright colors of Distress Inks, I set to work. This is my favorite size to use right now. I cut 6 pieces from Specialty Stamping paper about 3 1/2 inches square. You can cut them right to size if you want (2 3/8"). I just had these cut, so I used them. Haul out your stash of Tissue Tapes, too. Commute and Laboratorie are used on the Easter egg square. Using bright colors like Mustard Seed, Squeezed Lemonade, Ripe Raspberry, Fired Brick, Peacock Feathers, Seedless Preserves, and Mowed Grass first, I randomly applied them to the paper with the Blending Tools. I also added darker colors like Barn Door, Rusty Hinge, and Mahogany to the edges and Mustard Seed areas. LOTS and LOTS of layers makes for a deep, rich color. This helps to create a real contrast when you "clap" some water spots on the colors and let them really soak in before blotting with a paper towel. Dry with a heat tool and add your Tissue Tapes. Then comes the stamping. 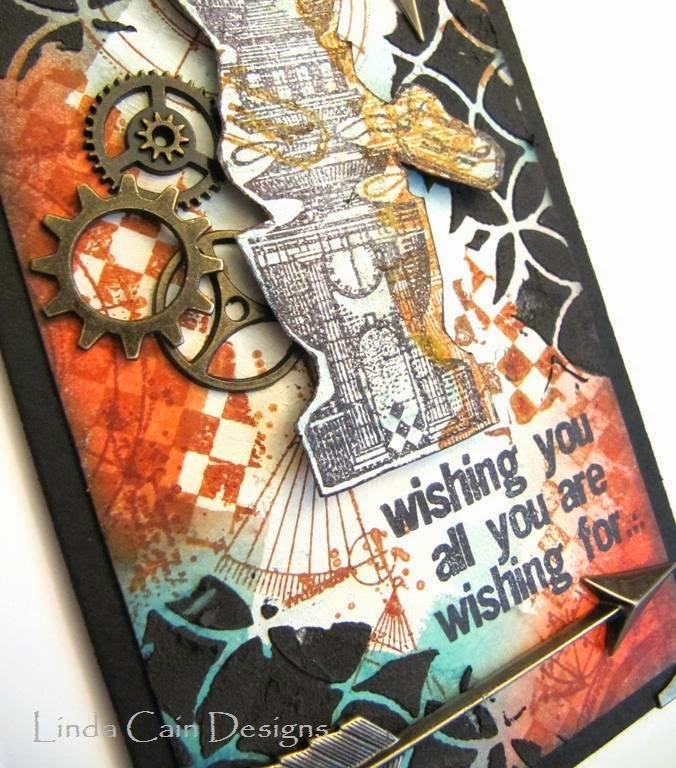 I used the Mini Blue Prints 2 for the main stamping with Jet Black Archival Ink. 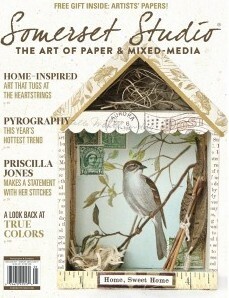 The top has the Bird from Natures Moments with Symphony and Market Place Tissue Tapes. White Sharpie Pens are great for adding contrast as well as the little Rhinestone Flowers. This little Bunny is so nice and bright with the Picked Raspberry and Seedless Preserves. The water created little spots on him. I used Silver and Gold Metal Dot Stickers as well as Pearls on the squares. This side needed just a bit more of something, so I added a piece of fancy black trim. 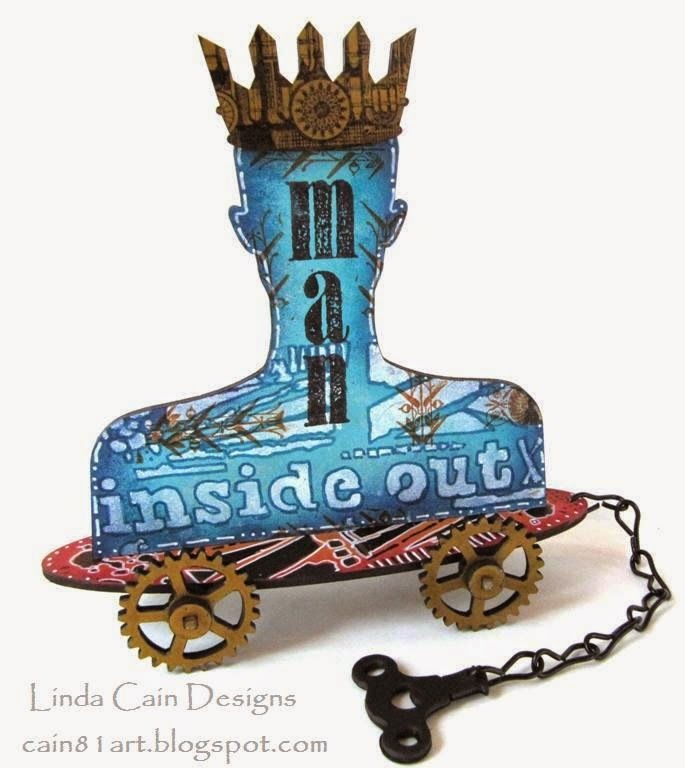 All the edging stamps are from the Prima set Mixed Media Doll Stamp. It has 7 great edging stamps that are each 7 inches long. Perfect for tags and cards. I love the little flowers on this stamp. I added the Laboratorie and Elements Tissue Tape here, but many are from several years past. The Natures Garden Charm Roses are perfect for their size and color. The top has a Petaloo Flower and leaf. I used March and April from the Traveler Tissue Tape collection, and the Journeyman, and Nostalgic tapes, too, for this side. I painted a wooden pedestal and added 3 kinds of Tissue Tape to set the ATB on, but I think I like it better just sitting on my bookcase all by itself. I hope Spring is coming your way if you've been waiting for it here in the States. You can make this an Easter ATB of just a Springtime one.....the choice is yours! 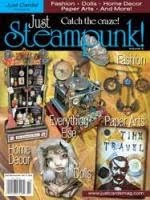 Check out the links and don't forget to use my code iecain81 when ordering from Inspiration Emporium for 10% off, and always $5 shipping in the USA. Other links are to Retro Cafe Art Gallery. 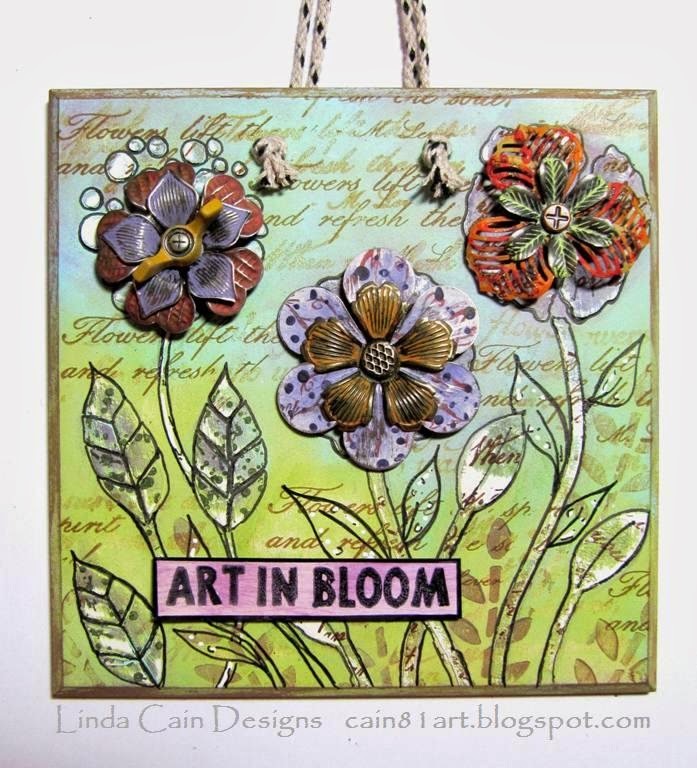 Join me over there where we'll use Metal Embellishments, paints, stamps, stencils and more! 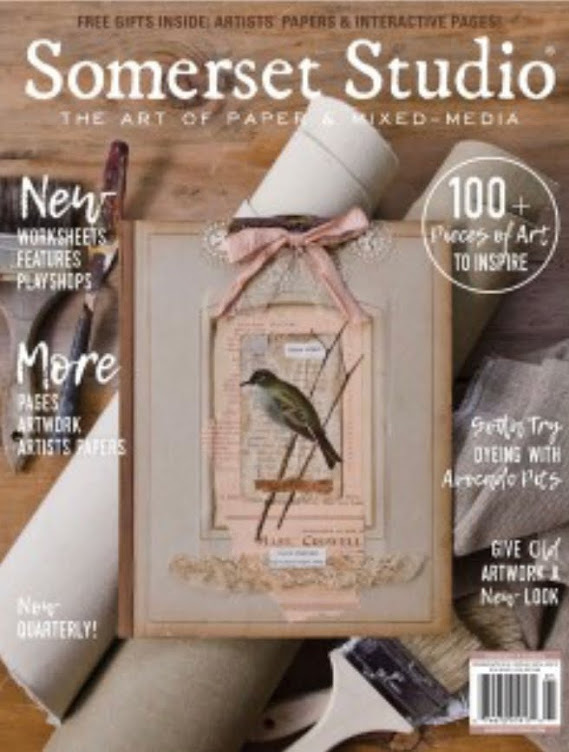 I have fallen in love with the Found Relatives from Tim Holtz. They've captured my heart. And these little guys from long ago are no exception. This is a small journal page that I removed from the book and will add back in with Tissue Tape later. I find it's a lot easier to work with this way and doesn't detract from your Journal. I removed the top layer of the card from the chipboard. It comes apart easily. Then I glued the Boys to the page with Matte Multi Medium. When dry I added Modeling Paste over the Burlap Stencil and let it dry. It appears I had some Distress Ink on the stencil from a previous time, and that ended up looking pretty cool! Then I glued torn pieces of old book pages randomly around the edges with Glue-n-Seal. Use the glue over the top of the torn papers as well to seal. The coloring of the photo is all done in layers of inks with a brush, and pens.This is just the first layer. I kept adding until I got the colors I liked. I added more Distress Inks all over for more color. The last layer is stamps that I heat set each time just to be sure. 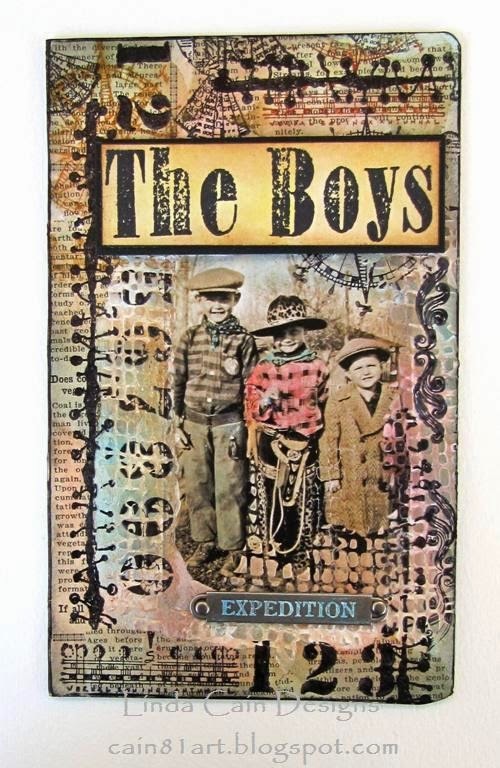 "The Boys" is stamped onto white Stamping Paper and aged with Distress Inks. Then I mounted it onto black mat board. The Expedition Word Band has a couple of blue paint colors added and wiped off to make the word stand out. Add it with 2 brads. Inspiration Emporium when you use my code iecain81.